I poured a 500ml bottled into a nonic pint glass. It had a best before date of June 2014 (though it appears to have been bottled in 2012). It cost $4.49 ($0.27 per ounce). Appearance: Seemingly opaque black but actually a deep shade of ruby red. Pours to a somewhat large, tan, frothy head which laces and retains well. Smell: Typical pub-style stout aroma. Some roasted barley, chocolate notes, a hint of salt. Taste: If you were to judge this beer by its name you’d probably have some unusual expectations. Truth be told, Kelpie Seaweed Ale is essentially just a British pub-style stout that’s brewed with seaweed in the mash. Everything else about it normal, with the addition of some slight salty to tangy character. In fact, it’s almost a bit disappointing that the beer is so normal. That being said, I’ll take normal and good to unusual and bad any day. 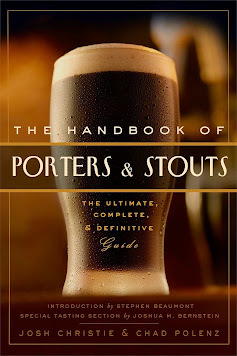 The palette is quite familiar, especially to that of a sessionable, classically-brewed stout. Roasted malts are accounting for the majority of the taste - creating for noticeable dark chocolate flavors, plus some sweet cola-like notes, too. Not much else happening, though. No real hop presence to speak of, though there is a combination of minor bitterness, saltiness and tanginess on the finish. How much of this comes from hops, seaweed, and the fact the bottle is likely old I’m not sure. Still, it’s a satisfying brew. Drinkability: I was nervous about drinking this bottle since the beer is only 4.4% ABV. Beers of such light weight tend to expire quickly, but Kelpie Seaweed Ale has held up quite well. It definitely has a lot of flavor for an otherwise light-bodied, easy-drinking, sessionable beer. It is noticeably thin in the mouth and finishes almost completely clean. This would be a great session beer if the price were right. Labels: Scotland, Scottish Gruit/Ancient Herbed Ale, Williams Brothers Brewing Co.